Have you ever been in a situation where you had a great idea that you wanted to implement and then someone asked you if have a PIA for that? Enter your name and email below to watch the entire video right away! [mc4wp_form id="50026"] By entering your email address above, you are requesting about upcoming training and related resources. You can opt out at any time, and we'll never rent or sell your email address. Click on the >> arrow above to play the video. Maybe you wanted to add a new digital health app to make it easier for patients to book appointments with you, or get access to Alberta Netcare Portal, use the internet to get on-line consultations for your patients, or start using a new EMR. Or maybe you have a new healthcare practice and you are excited about choosing the right location, the right equipment, the right vendors that fit your budget and your goals. A PIA is a practical business tool in your healthcare practice. A PIA is an important tool that you can use to help you with that project management. It will help you anticipate risks to the project before it starts and avoid serious problems, wasted time and money. The PIA process requires you to have written policies and procedures so that you can implement the project effectively and train your staff consistently. Sometimes a PIA is a requirement of legislation. But it is always a best practice whenever you implement a project that includes personal health information. Watch the video now to take a look at what is a PIA, what will a PIA do for you, and when you need a PIA. Just click on the image above to play the video. Would you like more information about Privacy Impact Assessments for your healthcare practice? By entering your email address above, you are requesting about upcoming training and related resources. You can opt out at any time, and we'll never rent or sell your email address. A Privacy Impact Assessment is Easy – When You Start With a Good Plan! Do you need a PIA? or a PIA amendment? If you are a healthcare provider or clinic manager and are not sure if you need a Privacy Impact Assessment . . . then this 30 minute free webinar is for you! If you are a custodian–including physicians, optometrists, dentists, chiropractors, nurse practitioners, podiatrists, and more!–as defined by Alberta's Health Information Act, then you probably need a PIA. how to start planning to prepare a PIA. Get access to the course right away! The replay is ready! Register for the FREE 30 minute Webinar recorded live! You will also benefit from receiving notices about upcoming events on Practice Management Nuggets Webinars for Your Healthcare Practice and similar announcements. 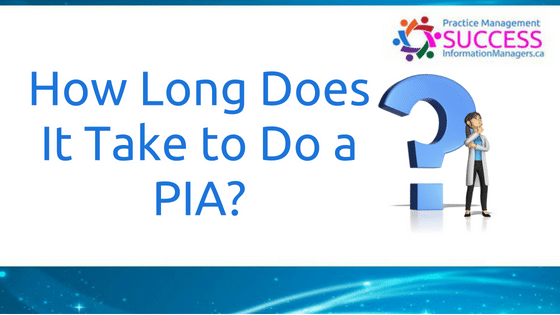 How Long Does It Take to Do a PIA? Each month, we discuss your questions about practice management, human resources issues, clinic management best practices, procedures, resources, practical privacy tips, and more in Practice Management Success membership. Click here for more tips about PIA's! Click the >> arrow above to play the video. I’m opening my practice next month. I just learned that I need to complete a Privacy Impact Assessment. Unfortunately, I hear this question far too often! In the perfect world, you will start your PIA process about 6 months before you plan to open your practice. 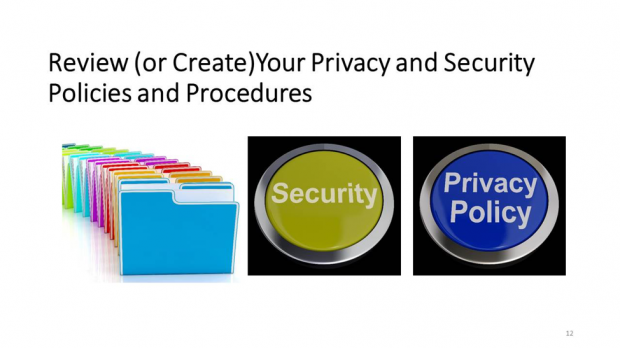 You will start with developing the privacy and security policies and procedures. Next, you will discuss with the EMR vendors, computer IT support vendors, and other stakeholders about your operational needs and ensure that the vendors can meet PIA requirements. At this point, about 4 months before Go Live, you will start writing your Privacy Impact Assessment documents. You will review and accept the Privacy Impact Assessment internally to your organization and ensure that each of the custodians have reviewed, understood, and accepted the Privacy Impact Assessment. Then, you will submit the Privacy Impact Assessment to the Office of the Information and Privacy Commissioner (OIPC) about 3 months before your go-live date. If you are planning to open your healthcare practice soon or planning to implement a new project in your existing clinic, your first step is to review (or create) your privacy and security policies and procedures. 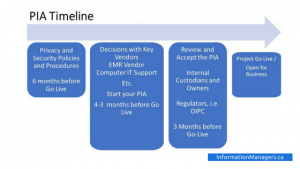 To help you with your discussion of PIA requirements with your vendors, the OIPC has produced a document, “Guidance for Electronic Health Record Systems“. 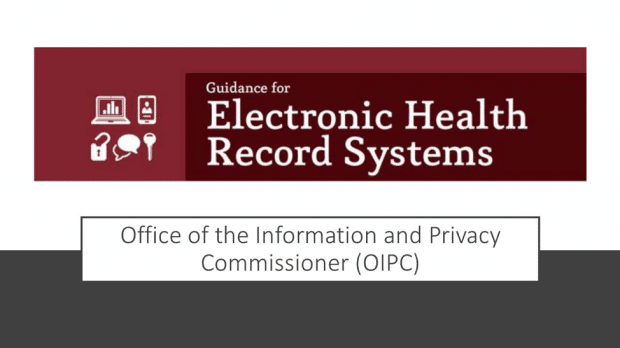 This guide was developed to assess the safeguards in electronic health record (EHR) systems. Custodians and their EHR service providers may use this document to support a Privacy Impact Assessment on an EHR system, or to examine whether changes to a system comply with Health Information Act requirements. Published in June 2016. This is intended to assist you to have a discussion with your vendors. The guidelines are not part of the PIA submission. The Guideline will help you to ask good questions with your vendors so that you can get good answers. You will include the answers to the questions in your PIA submission. If you are currently looking for a vendor for your EMR, practice management system, computer network system or, perhaps, your billing system, these are the questions that you need to discuss with your vendor. Their answers will help to inform you and assist you in selecting good vendors for your practice. If you are a vendor that supports healthcare practices, I encourage you to download the document, Guidance for Electronic Health Record Systems, and complete it from the perspective of your product or service even if your product isn't an EHR. Then, you can share the completed document with your prospective clients and custodians as a demonstration of your privacy and security practices and support your clients with their PIA submission. If you haven’t done your PIA yet, you definitely need to get this completed. You need to have your policies and procedures completed and your PIA submitted to the OIPC for their review and acceptance before you open your new practice. Does a Dentist Need a PIA? In this Q&A, we're talking about: Does a Dentist Need a PIA? If you are a member of Practice Management Success, login and join me now on the webinar. The replay will be available in your membership area. I’ve had a dental practice for 10 years. Do I need a PIA? In Alberta, the Health Information Act (HIA) was proclaimed in 2001. Dentists and dental hygienists were named as a designated health professional under the HIA in March 2011. There is a ‘grandfathering’ period when custodians who were already in practice at the time are not required to submit a privacy impact assessment (PIA). The dental practice, of course, must meet all of their dental college requirements including appropriate privacy and security policies, procedures, and reasonable safeguards to protect the privacy, confidentiality, and security of personal health information. administrative practice, for example, changes to billing practices, third party contractors, moving to a new location, etc. The PIA is a process that assists custodians to review the impact that an implementation of a new administrative practice, information system, or change to existing practices or systems relating to the collection, use and disclosure of individually identifying health information, may have on individual privacy. A PIA describes the information flows in the project, identifies the legal authorities that allow for the flow of information, assesses potential impacts on and risks to privacy and identifies mitigation strategies to minimize the risks. The process is designed to ensure that the custodian evaluates the new practice or proposed change to ensure technical compliance with the HIA as well as assessing the broader privacy implications for individuals. Often, the Privacy Officer of the dental practice completes the Privacy Impact Assessment. However, the custodian or CEO is responsible for the Privacy Impact Assessment. Privacy principles and legal authority determine compliance obligations. If you don't have a PIA already for your dental practice, and you were in practice prior to 2011, you probably will need a PIA soon. If you opened your practice after 2011, or are just planning your practice now, you need a PIA. What is an Information Manager Agreement (IMA)? Having a clear agreement of how patient records will be maintained to ensure privacy, security, and confidentiality in a paper based patient record or in a shared EMR database is the objective of an Information Manager Agreement. This may also be called a Data Sharing Agreement, Information Sharing Agreement, or Business Associate Agreement. In a group healthcare practice, have a clear understanding in writing that sets out how patient records will be collected, used, and disclosed during the group practice is critical to the security of the patient information, health service provider information, and good will between members of the group practice. Think of this as the ‘prenuptial' agreement in your business relationship. Who is an Information Manager? In Alberta, the Health Information Act (HIA) defines an information manager. Generally, it is a special kind of an affiliate, usually a business or a vendor, who provides a service that does some specific task (authorized by the custodian) with health information. This could be a billing agent, accredited billing submitter, outsourced transcriptionist, EMR vendor or other service provider. If you are using an EMR vendor, the named individuals on the IMA are the only persons that the software vendor can receive instructions on how to manage the records in the database. Often, this is the physician lead and business owner. Sometimes, the custodian is also the information manager. For example, a physician (custodian) and business owner may assume the responsibility of ensuring the security of all the patient records authored by other custodians in the group practice. The physician / custodian / business owner / information manager must follow all the rules of the IMA and HIA. Not every healthcare practice has an information manager. Some group practices have many information mangers providing different services. There are many details and options to consider. The discussion–and then putting it in writing–is the key to positive business relationship and secure records management. Take a pro-active privacy role and inform patients how their information will be protected during the routine practice operations and when healthcare providers are added to – or leave – the practice. Decide how you are going to decide about the on-going operational changes to how the software will be used in your practice. Identify in the EMR software who is the primary (or default) healthcare provider for each patient. Talk with your software vendor how best to record this. It’s never too late to start! 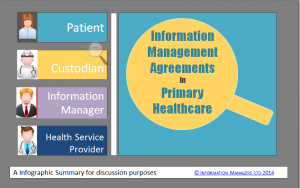 If you missed creating an Information Management Agreement or Data Sharing Agreement in your group practice, do it now! See the Digital Resources for samples that you can use. Does your medical practice collect personal health information? If so, you may need to conduct a Privacy Impact Assessment (PIA). Information Managers' Privacy Impact Assessment (PIA) consultation helps you document your practices, meet practice management best practices, and ensure compliance with regulatory legislation. The PIA consultation includes reviewing your current practices, documenting current or new privacy and security policies and procedures, information flow, legal authority analysis, risk assessment, and Privacy Impact Analysis. Contact us and we’ll take a look at your current office practices and let you know how we can help make your workload easier, your information secure, and meet regulatory compliance. What do you know about Privacy Impact Assessments (PIAs)? If you have implemented an electronic medical record (EMR ) funded through a provincial program, you have probably had to go through a PIA. It was probably time consuming to some degree, but perhaps not as bad as you thought. 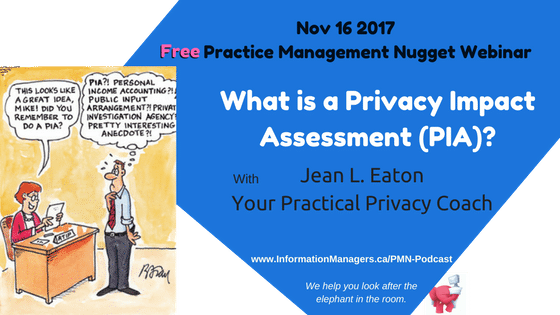 Jean Eaton is a consultant and expert on Privacy Impact assessments in the medical office. She explains in this blog post, The ABCs of Privacy Impact Assessments, what you should expect when required to undertake a PIA. Listen to the podcast with Dr. Alan Brookstone of Canadian EMR. Document Management Tip: What is a Privacy Impact Assessment? YouTube video: What is a Privacy Impact Assessment? Who needs a PIA? How can I tell if I have a PIA? Information about privacy impact assessments in Canada. Additional details for Alberta and Health Information Act, HIA, OIPC. Having problems viewing the video here? Watch it on our YouTube channel: What is a PIA? A PIA should be as common place to a healthcare practice as a business plan is to a business. BUT most healthcare practices don’t know this and often don’t know that a PIA is usually part of their professional college requirements and often even a legislated requirement! Prevent malicious errors, omissions or attacks that could result in fines and even jail time for the business, healthcare provider, employee, or vendor by completing a PIA. The Clinic Manager and Physician Lead and Privacy Officer must ensure its content is updated to reflect the current state of administrative, physical and technical controls. BONUS! Checklist to update your PIA to meet recent changes to Alberta’s Netcare Portal. If your practice has completed a PIA and now you need to update the PIA, you receive a checklist of items that you need to consider to refresh your PIA. BONUS! One hour tele-consult with Jean, “Create a branded Privacy Impact Assessment Readiness Package”. 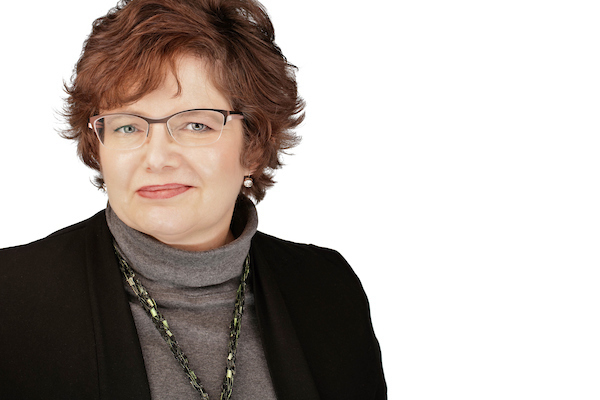 Jean will work individually with you to review your documentation and coach you on how to prepare the package to give to healthcare practices. BONUS! Vendor PIA live webinar includes Vendor non-disclosure agreement, Information Manager Agreement, GAP Analysis, Computer Network Narrative templates. Jean has helped hundreds of physicians, chiropractors, pharmacists, and other healthcare providers complete their Privacy Impact Assessment. She has visited hundreds of practices across Canada. But time and geography limit my ability to visit each healthcare practice that needs a PIA. That’s why I developed this on-line interactive course to help you learn everything you need in order to review, amend, or create your own PIA. Each module includes a weekly live webinar, as well as templates, tools, resources and two common case studies to build on each week. You can use these scenarios to guide you through the PIA process. You know your practice better than anybody else. If you had the right tools, at the time most convenient for you and a mentor to help you, you can develop good office practices, meet legislated and college requirements, and successfully complete your Privacy Impact Assessment requirements. Do You Need a New PIA When You Open a New Location? Congratulations! You are expanding to a new location! Do you have a PIA for that? 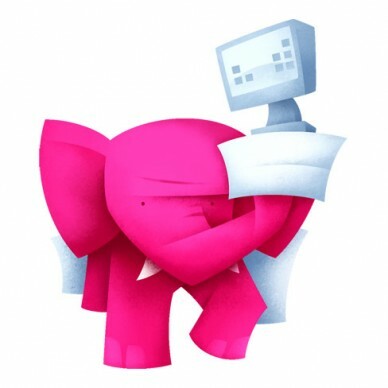 When a physician or another healthcare provider opens another location and both locations are remarkably similar – same employer, same ownership, same EMR and backup practices, etc. – then you may need to only update or amend your original Privacy Impact Assessment. My recommendation is to review the ‘Clinic Description’ of the initial Privacy Impact Assessment and edit and update all changes. This will help you to determine if they need a new Privacy Impact Assessment for the new location. If you have a lot of updates – you might need to prepare a Privacy Impact Assessment Amendment and include the information about your new location. If there are no significant changes, then it may be sufficient to update the clinic description for both clinics, add the additional description of the new clinic and send a Privacy Impact Assessment Amendment to the OIPC. This can often be a letter with an attachment of the updated clinic description. Most clinics have had, at least, a change in staffing, physicians, and privacy officers. Don't forget to consider when the original Privacy Impact Assessment was completed. If it was prior to 2014 then you will need to update your policies and procedures including the amendments to Alberta's Health Information Act and Alberta Electronic Health Records Regulations. For more information about PIA's see our introductory video.